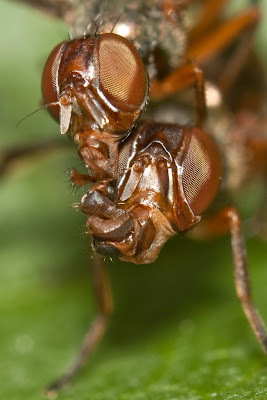 This is a family-friendly blog, so I'll spare the many, many comments that can be had at these flies' expense. Suffice it to say that Steve caught them in the act of mating, and that the one on the bottom (I presume the female) was blowing spit bubbles that the one on top (the male?) was eating. What in the world could that be? There's so little I know about fly mating, and I don't know if I'd have it any other way.